Utilising a five by three grid format rather than traditional reels, Firemen is a slot where its symbols appear in the windows of a building which rather regularly suffers from sudden fires that need to be extinguished. 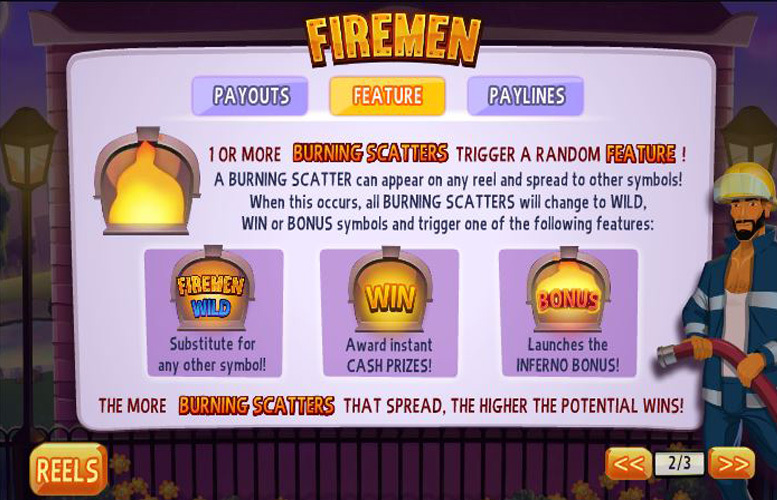 Those fires occur due to the game’s flaming scatter symbols, which provide players the chance to enhance their winnings through extra wilds, earn instant cash prizes or trigger an innovative Inferno Bonus round. The Inferno Bonus round puts a fun spin on the slot’s theme and offers players the chance to win generous instant cash prizes. Utilising a grid of windows rather than traditional reels, makes Firemen one of the most innovative looking slots around. Wild symbols and scatter that can become wilds help to boost winning potential. Firemen’s payline jackpots are comparatively quite small, with the top jackpot reaching just £2,500 at the highest possible bet level. Relatively little control is provided over staking amounts, as the number of active paylines cannot be altered and line bet amounts must fall between 1p and £5. Aside from its scatter symbols and related Inferno Bonus round, Firemen’s gameplay is pretty repetitive. 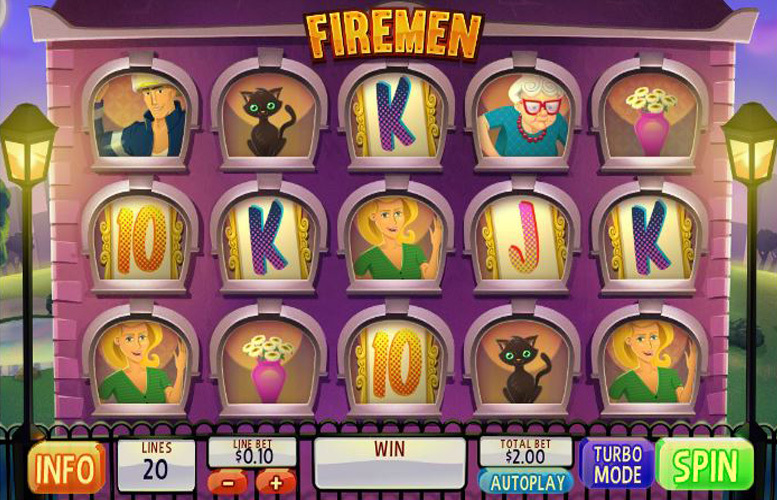 Whilst the overall format of the Firemen slot is a little unusual, its top jackpots are won in a recognisable way. That is by seeing five matching symbols line up consecutively from left to right along an active payline. The most valuable payline combination of all is one including five of the game’s wild symbols, which pays out a jackpot worth 500 times the selected line bet. Assuming that the highest possible line bet of £5 is selected, therefore, that jackpot will be worth a total of £2,500. Aside from its window rather than reels format, Firemen is actually quite a straightforward slot. Its only additional game elements are a wild symbol and a flaming scatter symbol which can trigger one of three features. Further to being able to create the slot’s most valuable payline combination, its wild symbol also performs traditional wild substitutions. That means it can stand in for any other symbol, apart from the scatters, in order to produce the most valuable possible symbol combinations. Able to appear anywhere on the reels, when one or more of the flaming scatter symbols do arise they trigger one of three different features. Those are that they either become extra wilds, deliver instant wins or launch the inferno bonus feature. What’s more, whenever a flaming scatter does appear, its flames can spread to others triggering one of the features on those spaces too. When triggered the Inferno Bonus round sees all of the Firemen spaces set ablaze. Players must then click on each space in order to extinguish. Each space successfully put out delivers an instant win, but the round is over if an extinguished space reveals the word ‘Collect’. 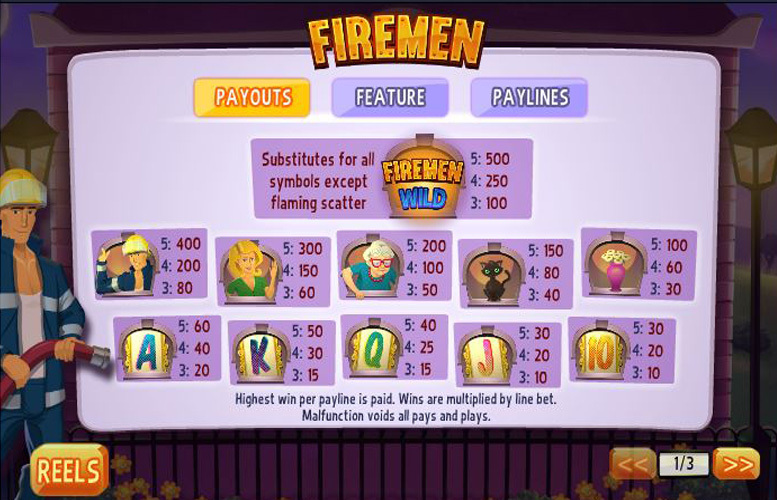 Occupying the windows of the building which replaces traditional reels for the Firemen slot, the game’s regular symbols depict images of people and things that the firemen will try to save from any blaze. The two regular symbols which deliver the most valuable payline jackpots are those showing off images of a fireman, a young woman and an old woman. A five symbol combination of the firemen symbols along a payline, results in a jackpot worth 400 times the line bet. Similar combinations of the young and the old woman symbols, meanwhile, produce payouts worth 300 and 200 times the bet per line, respectively. 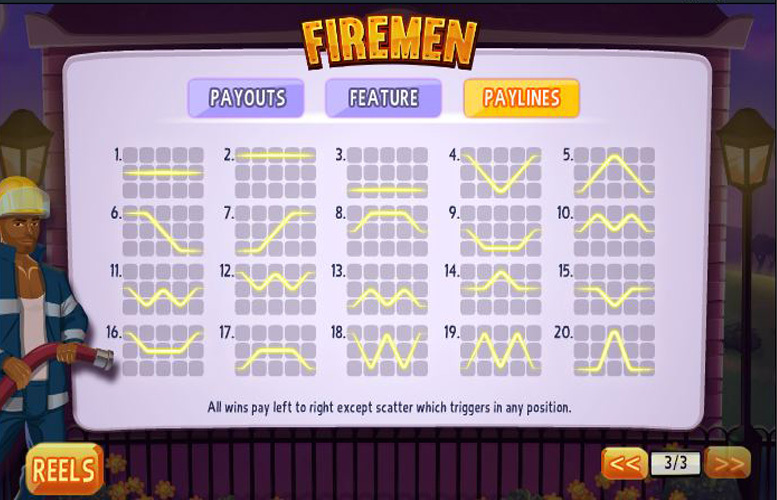 The Firemen slot unfortunately does not offer a great deal of control to players over the amount they wish to wager per spin. The slot’s 20 paylines are all always active, meaning that the only choice players get is over the amount they wish to bet per line. The minimum line bet any player can select stands at just 1p, the maximum is £5 and there are a handful of options in between the two. Overall, therefore, that means that the minimum possible stake per spin is 20p and the maximum is £100. With its innovative windowed format and fun overall theme, Firemen is a slot that promises much on the surface but which unfortunately delivers more disappointments than triumphs in practice. The size of the slot’s payline jackpots is the first area of real disappointment, given that the most generous payout does stand at just £2,500. Whilst that is a nice amount of money to receive, after all, it is considerably lower than the top jackpots provided by other games. What can be held up as an advantage of this slot, however, is that its wild symbols and multi-purpose scatters can enhance winnings and interest considerably. Away from those elements, however, the slot is lacking in other additional game features. This game has a rating of 4 / 5 with 304 total reviews by the users.